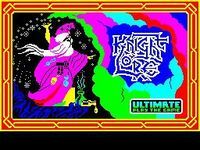 "Knight Lore is a computer game developed and released by Ultimate Play The Game in 1984. The game is the third in the Sabreman series, following on from his adventures in Sabre Wulf and Underwurlde. Unlike the earlier games in the series it used Ultimate's filmation engine to achieve a 3D look using isometric projection. In the game Sabreman has to find the ingredients for a magic potion. The game was written by Tim and Chris Stamper. Knight Lore was regarded as a revolutionary title and was the first of the "isometric adventure" genre, by displaying a detailed 3D world using isometric perspective. It was extensively copied by other publishers, and was described as being the second most cloned piece of software after WordStar." Source: Wikipedia, "Knight_Lore," available under the CC-BY-SA License.